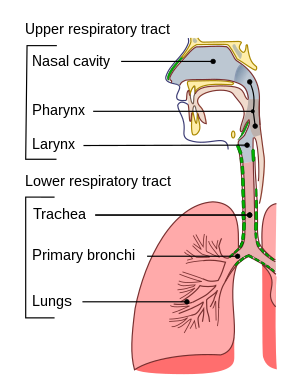 An Upper respiratory tract infection (URTI) is an illness caused by an acute infection, which involves the upper respiratory tract, including the nose, sinuses, pharynx, or larynx. This commonly includes nasal obstruction, sore throat, tonsillitis, pharyngitis, laryngitis, sinusitis, otitis media, and the common cold. Most infections are viral in nature, and in other instances, the cause is bacterial. URTIs can also be fungal or helminthic in origin, but these are far less common. In 2015, 17.2 billion cases of URTIs are estimated to have occurred. As of 2014, they caused about 3,000 deaths, down from 4,000 in 1990. In uncomplicated, colds, coughing, and nasal discharge may persist for 14 days or more even after other symptoms have resolved. Acute URTIs include rhinitis, pharyngitis/tonsillitis, and laryngitis often referred to as a common cold, and their complications: sinusitis, ear infection, and sometimes bronchitis (though bronchi are generally classified as part of the lower respiratory tract.) Symptoms of URTIs commonly include cough, sore throat, runny nose, nasal congestion, headache, low-grade fever, facial pressure, and sneezing. Symptoms of rhinovirus in children usually begin 1–3 days after exposure. The illness usually lasts 7–10 more days. Color or consistency changes in mucous discharge to yellow, thick, or green are the natural course of viral URTI and not an indication for antibiotics. Group A beta-hemolytic streptococcal pharyngitis/tonsillitis (strep throat) typically presents with a sudden onset of sore throat, pain with swallowing, and fever. Strep throat does not usually cause runny nose, voice changes, or cough. Pain and pressure of the ear caused by a middle-ear infection (otitis media) and the reddening of the eye caused by viral conjunctivitis are often associated with URTIs. In terms of pathophysiology, rhinovirus infection resembles the immune response. The viruses do not cause damage to the cells of the upper respiratory tract, but rather cause changes in the tight junctions of epithelial cells. This allows the virus to gain access to tissues under the epithelial cells and initiate the innate and adaptive immune responses. Up to 15% of acute pharyngitis cases may be caused by bacteria, most commonly Streptococcus pyogenes, a group A streptococcus in streptococcal pharyngitis ("strep throat"). Other bacterial causes are Streptococcus pneumoniae, Haemophilus influenzae, Corynebacterium diphtheriae, Bordetella pertussis, and Bacillus anthracis. Sexually transmitted infections have emerged as causes of oral and pharyngeal infections. A URTI may be classified by the area inflamed. Rhinitis affects the nasal mucosa, while rhinosinusitis or sinusitis affects the nose and paranasal sinuses, including frontal, ethmoid, maxillary, and sphenoid sinuses. Nasopharyngitis (rhinopharyngitis or the common cold) affects the nares, pharynx, hypopharynx, uvula, and tonsils generally. Without involving the nose, pharyngitis inflames the pharynx, hypopharynx, uvula, and tonsils. Similarly, epiglottitis (supraglottitis) inflames the superior portion of the larynx and supraglottic area; laryngitis is in the larynx; laryngotracheitis is in the larynx, trachea, and subglottic area; and tracheitis is in the trachea and subglottic area. Low- or very-low quality evidence indicates probiotics may be better than placebo in preventing acute URTIs. Vaccination against influenza viruses, adenoviruses, measles, rubella, Streptococcus pneumoniae, Haemophilus influenzae, diphtheria, Bacillus anthracis, and Bordetella pertussis may prevent them from infecting the URT or reduce the severity of the infection. Use the shortest effective course; should see improvement in 2–3 days. Continue treatment for 7 days after symptoms improve or resolve (usually a 10–14 day course). Treatment comprises symptomatic support usually via analgesics for headache, sore throat, and muscle aches. Moderate exercise in sedentary subjects with a naturally acquired URTI probably does not alter the overall severity and duration of the illness. No randomized trials have been conducted to ascertain benefits of increasing fluid intake. Prescribing antibiotics for laryngitis is not a suggested practice. The antibiotics penicillin V and erythromycin are not effective for treating acute laryngitis. Erythromycin may improve voice disturbances after a week and cough after 2 weeks, but any modest subjective benefit is not greater than the adverse effects, cost, and the risk of bacteria developing resistance to the antibiotics. Health authorities have been strongly encouraging physicians to decrease the prescribing of antibiotics to treat common URTIs because antibiotic usage does not significantly reduce recovery time for these viral illnesses. The use of narrow-spectrum antibiotics has been shown to be just as effective as broad-spectrum alternatives for children with acute bacterial URTIs, and has a lower risk of side effects in children. Decreased antibiotic usage could also have prevented drug-resistant bacteria. Some have advocated a delayed antibiotic approach to treating URTIs, which seeks to reduce the consumption of antibiotics while attempting to maintain patient satisfaction. A Cochrane review (updated 2017) of 11 studies and 3,555 participants explored antibiotics for respiratory tract infections. It compared delaying antibiotic treatment to either starting them immediately or to no antibiotics. Outcomes were mixed depending on the respiratory tract infection; symptoms of acute otitis media and sore throat were modestly improved with immediate antibiotics with minimal difference in complication rate. Antibiotic usage was reduced when antibiotics were only used for ongoing symptoms and maintained patient satisfaction at 86%. Disability-adjusted life year for URTIs per 100,000 inhabitants in 2002. According to a Cochrane review, a single oral dose of nasal decongestant in the common cold is modestly effective for the short-term relief of congestion in adults; however, data on the use of decongestants in children are insufficient. Therefore, decongestants are not recommended for use in children under 12 years of age with the common cold. Oral decongestants are also contraindicated in patients with hypertension, coronary artery disease, and history of bleeding strokes. No good evidence supports the effectiveness of over-the-counter cough medications for reducing coughing in adults or children. Children under 2 years old should not be given any type of cough or cold medicine due to the potential for life-threatening side effects. In addition, according to the American Academy of Pediatrics, the use of cough medicine to relieve cough symptoms should be avoided in children under 4 years old, and the safety is questioned for children under 6 years old. Routine supplementation with vitamin C is not justified, as it does not appear to be effective in reducing the incidence of common colds in the general population. The use of vitamin C in the inhibition and treatment of upper respiratory infections has been suggested since the initial isolation of vitamin C in the 1930s. Some evidence exists to indicate that it could be justified in persons exposed to brief periods of severe physical exercise and/or cold environments. Given that vitamin C supplements are inexpensive and safe, people with common colds may consider trying vitamin C supplements to assess whether they are therapeutically beneficial in their case. Some low-quality evidence indicates the use of nasal irrigation with saline solution may alleviate symptoms in some people. Also, saline nasal sprays can be of benefit. Children have two to nine viral respiratory illnesses per year. In 2013, 18.8 billion cases of URTIs were reported. As of 2014, they caused about 3,000 deaths, down from 4,000 in 1990. In the United States, URTIs are the most common infectious illness in the general population, and are the leading reasons for people missing work and school. ^ a b Vos, Theo; Allen, Christine; Arora, Megha; Barber, Ryan M.; Bhutta, Zulfiqar A.; Brown, Alexandria; Carter, Austin; Casey, Daniel C.; Charlson, Fiona J.; Chen, Alan Z.; Coggeshall, Megan; Cornaby, Leslie; Dandona, Lalit; Dicker, Daniel J.; Dilegge, Tina; Erskine, Holly E.; Ferrari, Alize J.; Fitzmaurice, Christina; Fleming, Tom; Forouzanfar, Mohammad H.; Fullman, Nancy; Gething, Peter W.; Goldberg, Ellen M.; Graetz, Nicholas; Haagsma, Juanita A.; Hay, Simon I.; Johnson, Catherine O.; Kassebaum, Nicholas J.; Kawashima, Toana; et al. (October 2016). "Global, regional, and national incidence, prevalence, and years lived with disability for 310 diseases and injuries, 1990-2015: a systematic analysis for the Global Burden of Disease Study 2015". Lancet. 388 (10053): 1545–1602. doi:10.1016/S0140-6736(16)31678-6. PMC 5055577. PMID 27733282. ^ Pokorski 2015, p. 28. ^ a b c d e f g h i j k l "Rhinitis Versus Sinusitis in Children" (PDF). Centers for Disease Control and Prevention. Archived (PDF) from the original on 16 February 2017. Retrieved 19 December 2016. ^ Heymann 2015, pp. 443–445. ^ a b Lozano R, Naghavi M, Foreman K, Lim S, Shibuya K, Aboyans V, et al. (December 2012). "Global and regional mortality from 235 causes of death for 20 age groups in 1990 and 2010: a systematic analysis for the Global Burden of Disease Study 2010". Lancet. 380 (9859): 2095–128. doi:10.1016/S0140-6736(12)61728-0. PMID 23245604. ^ Pokorski 2015, p. 27. ^ Bisno AL (January 2001). "Acute pharyngitis". The New England Journal of Medicine. 344 (3): 205–11. doi:10.1056/nejm200101183440308. PMID 11172144. ^ "Human papillomavirus (HPV) and Oropharyngeal Cancer, Sexually Transmitted Diseases". Centers for Disease Control and Prevention. 4 November 2016. Archived from the original on 16 December 2016. Retrieved 19 December 2016. ^ Hao Q, Dong BR, Wu T (February 2015). Dong BR (ed.). "Probiotics for preventing acute upper respiratory tract infections". The Cochrane Database of Systematic Reviews. 9 (2): CD006895. doi:10.1002/14651858.CD006895.pub3. PMID 25927096. ^ Weidner T, Schurr T (August 2003). "Effect of exercise on upper respiratory tract infection in sedentary subjects". British Journal of Sports Medicine. 37 (4): 304–6. doi:10.1136/bjsm.37.4.304. PMC 1724675. PMID 12893713. ^ Guppy MP, Mickan SM, Del Mar CB (February 2004). ""Drink plenty of fluids": a systematic review of evidence for this recommendation in acute respiratory infections". BMJ. 328 (7438): 499–500. doi:10.1136/bmj.38028.627593.BE. PMC 351843. PMID 14988184. ^ a b c d Reveiz L, Cardona AF (May 2015). "Antibiotics for acute laryngitis in adults". The Cochrane Database of Systematic Reviews (5): CD004783. doi:10.1002/14651858.CD004783.pub5. PMID 26002823. ^ Gerber JS, Ross RK, Bryan M, Localio AR, Szymczak JE, Wasserman R, Barkman D, Odeniyi F, Conaboy K, Bell L, Zaoutis TE, Fiks AG (December 2017). "Association of Broad- vs Narrow-Spectrum Antibiotics With Treatment Failure, Adverse Events, and Quality of Life in Children With Acute Respiratory Tract Infections". JAMA. 318 (23): 2325–2336. doi:10.1001/jama.2017.18715. PMC 5820700. PMID 29260224. ^ Spurling GK, Del Mar CB, Dooley L, Foxlee R, Farley R (September 2017). "Delayed antibiotic prescriptions for respiratory infections". The Cochrane Database of Systematic Reviews. 9: CD004417. doi:10.1002/14651858.CD004417.pub5. PMC 6372405. PMID 28881007. ^ "Mortality and Burden of Disease Estimates for WHO Member States in 2002" (xls). World Health Organization. 2002. Archived from the original on 16 January 2013. ^ Spurling GK, Del Mar CB, Dooley L, Foxlee R, Farley R (September 2017). Spurling GK (ed.). "Delayed antibiotic prescriptions for respiratory infections". The Cochrane Database of Systematic Reviews. 9: CD004417. doi:10.1002/14651858.CD004417.pub5. PMC 6372405. PMID 28881007. ^ Tietze, KJ (2004). "Disorders related to cold and allergy". In Berardi, Rosemary R. (ed.). Handbook of Nonprescription Drugs (14th ed.). Washington, DC: American Pharmacists Association. pp. 239–269. ISBN 978-1-58212-050-8. OCLC 56446842. ^ Covington, Timothy R., ed. (2002). "Common cold". Nonprescription Drug Therapy: Guiding Patient Self-care (1st ed.). St Louis, MO: Facts & Comparisons. pp. 743–769. ISBN 978-1-57439-146-6. OCLC 52895543. ^ Smith SM, Schroeder K, Fahey T (November 2014). "Over-the-counter (OTC) medications for acute cough in children and adults in community settings". The Cochrane Database of Systematic Reviews (11): CD001831. doi:10.1002/14651858.CD001831.pub5. PMID 25420096. ^ Research, Center for Drug Evaluation and. "Special Features – Use Caution When Giving Cough and Cold Products to Kids". www.fda.gov. Archived from the original on 12 January 2017. Retrieved 23 January 2017. ^ Goldsobel AB, Chipps BE (March 2010). "Cough in the pediatric population". The Journal of Pediatrics. 156 (3): 352–8. doi:10.1016/j.jpeds.2009.12.004. PMID 20176183. ^ a b c Hemilä H, Chalker E (January 2013). "Vitamin C for preventing and treating the common cold". The Cochrane Database of Systematic Reviews (1): CD000980. doi:10.1002/14651858.CD000980.pub4. PMC 1160577. PMID 23440782. ^ King D, Mitchell B, Williams CP, Spurling GK (April 2015). "Saline nasal irrigation for acute upper respiratory tract infections" (PDF). The Cochrane Database of Systematic Reviews (4): CD006821. doi:10.1002/14651858.CD006821.pub3. PMID 25892369. Heymann, David (2015). Control of communicable diseases manual : an official report of the American Public Health Association. APHA Press, the American Public Health Association. ISBN 9780875530185. Pokorski, Mieczyslaw (2015). Pulmonary infection. Cham: Springer. ISBN 978-3-319-17458-7.